My hope for every client is to obtain the highest benefit possible from counseling. I strive to join with each client at the point they feel most comfortable in order to begin the journey of permanent change. By uncovering the inner strengths that everyone possesses, I work with clients to overcome challenging life obstacles while partnering with them to assure the counseling direction is a perfect fit. I do not believe that one particular technique or method works with every person. Rather, my interest is aligning with the client on what works best. If we find the counseling path is not being helpful, then it is my ultimate goal to change gears and travel a new direction. 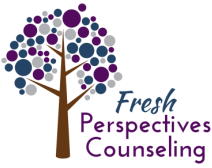 At Fresh Perspectives Counseling, we are in awe of the endurance of human spirit, and strive to assist you by providing a supportive nurturing environment, while helping you gain a clearer perspective and renewed sense of your personal strengths.